Muscles account for 40% of the total body mass and whenever they are injured by any kind of assault like ischemic, toxic, infective, inflammatory or metabolic insult, there occurs dissolution of muscle fibers, that is, rhabdomyolysis resulting in release of toxic intracellular components into circulation. Rhabdomyolysis is a life-threatening clinical syndrome resulting in myoglobinuria, electrolyte disturbances, and acute kidney injury (AKI). Dissolution of myocyte membrane results in leakage of myocyte contents, including electrolytes, myoglobin, enzymes (creatine kinase [CK], aldolase, lactate dehydrogenase) into the circulatory system. Myoglobin, after entering into the circulatory system is filtered by glomerulus and causes injury to the glomerulus and tubules by various mechanisms. This renal damage is further aggravated by coexisting morbidities like hypovolemia, acidosis, infection, and ultimately patients land up in a severe and life-threatening condition that can be termed as "myorenal syndrome." Myoglobin is a single peptide protein with molecular weight 17.8 kDa composed of 153 amino acids with single prosthetic heme group. It amounts to approximately 1-3% of dry weight of muscles and in trained athletes amount of myoglobin is higher. It binds to oxygen and facilitates delivery of oxygen to sites of oxidative metabolism in muscle cells working under low oxygen tension. Myoglobin is catabolized by glomerular filtration, proximal tubular absorption by endocytosis, and proteolysis. In conditions of muscle tissue injury free myoglobin enters into circulation and most of them bind to haptoglobin and α2 globulin. Very small amount of circulating myoglobin can be cleared by reticuloendothelial system, but when the plasma level exceeds 1.5 mg/dL, it is filtered by the kidneys. Tea colored or brown colored urine occurs when the urine concentration of myoglobin exceeds 100 mg/dL. Myoglobinuria is seen during conditions, where there occurs damage to the muscle fibers, that is, rhabdomyolysis. Hence, both the terms are used synonymously. During rhabdomyolysis along with release of free myoglobin into circulation there occurs electrolyte imbalance, and release of other enzymes into the circulation and hypovolemia that further aggravate the renal injury. Rhabdomyolysis can be due to extrinsic or intrinsic causes. The various causes of rhabdomyolysis can be categorized into four groups based on the mechanism of injury, that is, physical, hypoxic, chemical, and biologic. Each of the four types of injury can be initiated by either extrinsic or intrinsic factors. Overall etiology of rhabdomyolysis is described in [Table 1]. Physical causes of rhabdomyolysis are overt trauma in conditions of mass disasters, road traffic accidents, assault, etc. However, rhabdomyolysis can also be precipitated by less severe injury in genetically susceptible individuals. Overuse of involuntary muscles as in seizures and status asthmaticus can result in rhabdomyolysis. Due to their peripheral location and poor vascularity, skeletal muscles are prone to ischemic injury due to external compression or internal causes. In addition to that during reperfusion free radicals are generated and they further aggravate the muscle injury. Many drugs like statins, succinyl choline, antipsychotics, steroids, propofol, and daptomycin have been implicated as other chemicals responsible for muscle tissue injury. Risk of rhabdomyolysis increases when statins were combined with drugs those inhibit cytochrome P 450 isoenzymes. Various electrolyte abnormalities like dysnatremia, hypokalemia, hyperphosphatemia can cause rhabdomyolysis and myoglobinuria. Among infectious agents bacterial, viral and parasitic causes are important. Legionella infection is the most common bacterial cause of rhabdomyolysis. Gram positive infection by Streptococcus pyogenes, Staphylococcus aureus are also important cause of pyomyositis. Influenza A and B infection is the most common viral culprit for myositis. Cases of rhabdomyolysis after HIV, EBV, and Coxsackie virus infection have also been reported. In addition cases of rhabdomyolysis after infection with candida, aspergillus, and malaria have been reported. Apart from infections snake bite, scorpion stings are important and most frequently encountered causes of rhabdomyolysis and myoglobinuria. Some inborn errors of carbohydrate and lipid metabolism have also been implicated in rhabdomyolysis and myoglobinuria. Mc-Ardle's disease is the most frequent underlying cause. Autoimmune disorders such as polymyositis, dermatomyositis, and hereditary forms of muscular dystrophy can also cause rhabdomyolysis. Endocrinal causes like hypothyroidism, hypoadrenalism, diabetic ketoacidosis can also present with myoglobinuria. Direct heme protein induced cytotoxicity. Intraluminal cast formation and tubular obstruction. Renal vasoconstriction is a characteristic feature of myoglobinuric AKI and it can be explained by several mechanisms. First, severe muscle necrosis in crush injuries cause fluid accumulation in third space and resultant intravascular fluid (IVF) depletion  and aggressive volume repletion during early postinjury period dramatically decreases kidney injury. This IV hypovolemia results in activation of renin-angiotensin system, vasopressin and sympathetic nervous system and further aggravates vasoconstriction. Second, severe muscle injury generates endotoxins like endothelin-1, thromboxane A2, TNF-α and they activate endotoxin cytokine cascade resulting in renal vasoconstriction. , Third, nitric oxide (NO), a potent endogenous vasodilator is scavenged by the heme proteins myoglobin. , In the setting of myoglobinemia, renal hypoperfusion is exacerbated because myoglobin maintains mean arterial pressure during volume depletion states by NO scavenging and increasing peripheral vascular resistance. Thus, hypovolemia could not be detected clinically and ischemic tissue injury is aggravated. Moreover, renal vasoconstriction can facilitate heme toxicity by decreasing GFR and prolonging their circulating half-life, promoting proximal tubular uptake and increasing the propensity for cast formation. IV volume depletion stimulates fluid reabsorption in tubules and increases intraluminal myoglobin concentration, favors cast deposition, and tubular obstruction. Heme protein cast formation and tubular obstruction primarily occurs in the distal tubules. Acidic urine, high concentration of myoglobin, and presence of Tamm-Horsfall protein largely determine formation of tubular casts. More the intraluminal concentration of myoglobin, higher is the chance of cast formation. Second most important factor is acidic urine. In acidic pH solubility of myoglobin is decreased and it forms aggregate with Tamm-Horsfall proteins. Since, Tamm-Horsfall proteins are primarily synthesized in distal tubules and stasis of myoglobin occurs more in distal tubules, they become the primary location for cast formation and resultant tubular obstruction. Hyperphosphatemia potentiating ischemic and nephrotoxic renal damage. Hyperuricemia contributes to cast formation and distal tubule obstruction. Severe crush injury and rhabdomyolysis triggers disseminated IV coagulation and results in intrarenal micro thrombus formation and aggravation of ischemic damage. 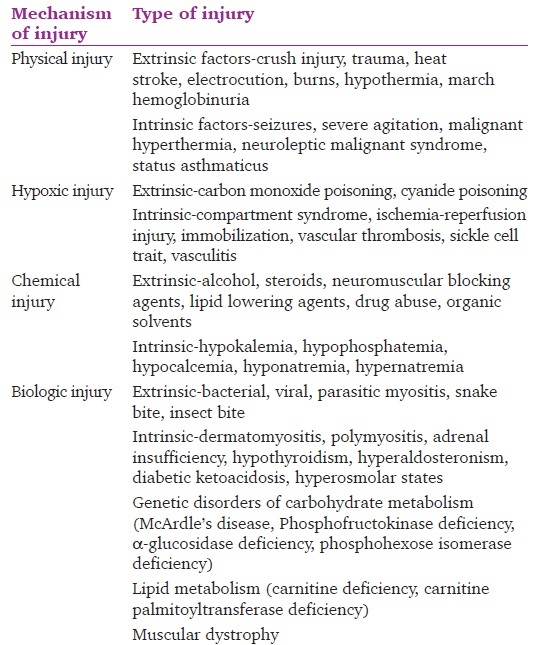 Hence, AKI in myoglobinuria is multifactorial and therapeutic approaches for prevention and treatment of rhabdomyolysis-induced acute kidney injuries are usually based on these proposed mechanisms. A thorough history and physical examination can provide clue to the underlying cause of rhabdomyolysis and myoglobinuria. CK levels are the most sensitive and specific indicators of myocyte injury. Elevated serum CK level at least 5 times the normal value with predominance of CK-MM fraction denotes striated muscle injury. Level of CK rises within 12 h of muscle injury, peaks in 1-3 days and declines 3-5 days after cessation of injury. Higher CK levels correlate with greater muscle injury. However, prediction of mortality and development of AKI from CK values is less reliable. When patient is on serial CK monitoring if the levels increase or fails to normalize despite therapy, it may suggest ongoing muscle injury or progression to ARF. Estimation of serum and urine myoglobin is less reliable in the diagnosis of rhabdomyolysis and myoglobinuria and hence should not be done routinely. During the early phase of muscle injury, its serum level is elevated. Myoglobin has a short half-life of 2-3 h and it is rapidly cleared by metabolism to bilirubin and renal excretion. Serum level of myoglobin also comes to normal after 6-8 h of muscle injury. Urine myoglobin is neither a sensitive test for rhabdomyolysis nor specific for the development of AKI. Hence, its routine testing should be discouraged. Apart from CK other enzymes elevated in rhabdomyolysis are carbonic anhydrase III in skeletal muscles, aldolase, troponin I, troponin T, lactate dehydrogenase, aminotransferases, etc. Creatinine is elevated to a greater extent than blood urea nitrogen in cases of rhabdomyolysis with ARF. Electrolyte abnormalities encountered are hyperkalemia, hyperphosphatemia due to release from the intracellular compartment. Serum calcium levels initially decrease as due to influx into the intracellular compartment and later on hypercalcemia occurs. Biochemical investigations to find out the cause of rhabdomyolysis should be done if no specific cause identified from history and physical examination. Patients should be monitored for the development of disseminated IV coagulation. The treatment of rhabdomyolysis comprises resuscitation and initial stabilization of the patient along with aggressive fluid therapy. Early hydration is the key to prevent or decrease the severity of AKI in patients with rhabdomyolysis. IVF should be started from prehospital care and maintained with continuous monitoring of vital parameters and urine output. Retrospective studies have found the incidence of AKI was lower when IVF initiated in crush injury patients immediately than those patients where IVF could not be administered early. , Forced diuresis when started within 6 h of injury minimizes the risk of AKI. Alkalization of urine by sodium bicarbonate has been postulated to reduce renal damage by preventing tubular cast formation. This therapy is controversial as a large volume of only crystalloid administered can alkalinize the urine sufficiently to prevent cast formation. , Moreover, large doses of bicarbonate can exacerbate hypocalcemia when hypovolemia is corrected. Antioxidants and free radical scavengers have a theoretical role in ischemia-reperfusion injury seen in rhabdomyolysis. Pentoxiphylline improves microvascular circulation and also decreases neutrophil adhesion and cytokine release. Other antioxidant molecules those may have role are Vitamin E, Vitamin C, 21-aminosteroid, etc. Despite optimal treatment 10-50% patients with myoglobinuria develop AKI requiring renal replacement therapy. Severe acidosis and hyperkalemia necessitates immediate dialysis. Daily hemodialysis or continuous hemofiltration is required to remove the urea and potassium released form muscle injury. Peritoneal dialysis is ineffective in myoglobinuria. Frequent intermittent hemodialysis may be required for rebound hyperkalemia and acidosis and moreover hemodialysis may be ineffective in removing circulating myoglobin. Continuous renal replacement therapy (CRRT) modes like continuous veno-venous hemofiltration and continuous veno-venous hemodiafiltration have the advantage of aborting these rebound complications and in addition to that convection removes myoglobin better than diffusion process. CRRT using high-flux filters are more effective in removing high molecular weight proteins like myoglobin. However, it is not clear that removal of myoglobin prevents or alters the clinical course of AKI. Hence, prophylactic CRRT is not recommended for myoglobin removal. Rhabdomyolysis and the resultant myoglobinuria is a potentially life-threatening condition encountered in conditions of extrinsic or intrinsic muscle injury. Whenever faced with such clinical scenario, aggressive fluid resuscitation should be done. Patients should be monitored by serum CK level and physicians should be watchful for the development of acute and delayed complications. Electrolyte imbalances should be treated as per protocol. There is no role of mannitol and forced alkaline diuresis in the management of myoglobinuria. Renal replacement therapy should be started in conditions of hyperkalemia and acidosis. CRRT is preferred over intermittent hemodialysis in managing patients with myoglobinuric acute kidney injuries. Perkoff GT, Tyler FH. Estimation and physical properties of myoglobin in various species. Metabolism 1958;7:751-9. Koskelo P, Kekki M, Wager O. Kinetic behaviour of 131-I-labelled myoglobin in human beings. Clin Chim Acta 1967;17:339-47. Knochel JP. Rhabdomyolysis and myoglobinuria. Annu Rev Med 1982;33:435-43. Landau ME, Kenney K, Deuster P, Campbell W. Exertional rhabdomyolysis: A clinical review with a focus on genetic influences. J Clin Neuromuscul Dis 2012;13:122-36. Malvy D, Dessalles PH, Monseau Y, Bonhoure JB. Legionnaire's disease and rhabdomyolysis. Intensive Care Med 1992;18:132-3. Bywaters EG, Stead JK. The production of renal failure following injection of solution containing myohaemoglobin. Q J Exp Physiol 1944;33:53-70. Ron D, Taitelman U, Michaelson M, Bar-Joseph G, Bursztein S, Better OS. Prevention of acute renal failure in traumatic rhabdomyolysis. Arch Intern Med 1984;144:277-80. Holt SG, Moore KP. Pathogenesis and treatment of renal dysfunction in rhabdomyolysis. Intensive Care Med 2001;27:803-11. Holt S, Reeder B, Wilson M, Harvey S, Morrow JD, Roberts LJ 2 nd , et al. Increased lipid peroxidation in patients with rhabdomyolysis. Lancet 1999;353:1241. Agmon Y, Peleg H, Greenfeld Z, Rosen S, Brezis M. Nitric oxide and prostanoids protect the renal outer medulla from radiocontrast toxicity in the rat. J Clin Invest 1994;94:1069-75. Bobadilla NA, Tapia E, Franco M, López P, Mendoza S, García-Torres R, et al. Role of nitric oxide in renal hemodynamic abnormalities of cyclosporin nephrotoxicity. Kidney Int 1994;46:773-9. Zager RA, Teubner EJ, Adler S. Low molecular weight proteinuria exacerbates experimental ischemic renal injury. Lab Invest 1987;56:180-8. Zager RA. Myoglobin depletes renal adenine nucleotide pools in the presence and absence of shock. Kidney Int 1991;39:111-9. Zager RA, Burkhart KM, Conrad DS, Gmur DJ, Iwata M. Phospholipase A2-induced cytoprotection of proximal tubules: Potential determinants and specificity for ATP depletion-mediated injury. J Am Soc Nephrol 1996;7:64-72. Zager RA, Burkhart KM, Conrad DS, Gmur DJ. Iron, heme oxygenase, and glutathione: Effects on myohemoglobinuric proximal tubular injury. Kidney Int 1995;48:1624-34. Zager RA. Combined mannitol and deferoxamine therapy for myohemoglobinuric renal injury and oxidant tubular stress. Mechanistic and therapeutic implications. J Clin Invest 1992;90:711-9. Reeder BJ, Wilson MT. Hemoglobin and myoglobin associated oxidative stress: From molecular mechanisms to disease States. Curr Med Chem 2005;12:2741-51. Zager RA. Studies of mechanisms and protective maneuvers in myoglobinuric acute renal injury. Lab Invest 1989;60:619-29. Dayer-Berenson L. Rhabdomyolysis: A comprehensive guide. ANNA J 1994;21:15-8. Akmal M, Massry SG. Reversible hepatic dysfunction associated with rhabdomyolysis. Am J Nephrol 1990;10:49-52. Huerta-Alardín AL, Varon J, Marik PE. Bench-to-bedside review: Rhabdomyolysis-An overview for clinicians. Crit Care 2005;9:158-69.
de Meijer AR, Fikkers BG, de Keijzer MH, van Engelen BG, Drenth JP. Serum creatine kinase as predictor of clinical course in rhabdomyolysis: A 5-year intensive care survey. Intensive Care Med 2003;29:1121-5. Ward MM. Factors predictive of acute renal failure in rhabdomyolysis. Arch Intern Med 1988;148:1553-7. Melli G, Chaudhry V, Cornblath DR. Rhabdomyolysis: An evaluation of 475 hospitalized patients. Medicine (Baltimore) 2005;84:377-85. Zager RA. Rhabdomyolysis and myohemoglobinuric acute renal failure. Kidney Int 1996;49:314-26. Woodrow G, Brownjohn AM, Turney JH. The clinical and biochemical features of acute renal failure due to rhabdomyolysis. Ren Fail 1995;17:467-74. Sinert R, Kohl L, Rainone T, Scalea T. Exercise-induced rhabdomyolysis. Ann Emerg Med 1994;23:1301-6. Knochel JP, Moore GE. Rhabdomyolysis in Malaria. N Engl J Med 1993;329:1206-7. Knottenbelt JD. Traumatic rhabdomyolysis from severe beating - experience of volume diuresis in 200 patients. J Trauma 1994;37:214-9. Homsi E, Barreiro MF, Orlando JM, Higa EM. Prophylaxis of acute renal failure in patients with rhabdomyolysis. Ren Fail 1997;19:283-8. Brown CV, Rhee P, Chan L, Evans K, Demetriades D, Velmahos GC. Preventing renal failure in patients with rhabdomyolysis: Do bicarbonate and mannitol make a difference? J Trauma 2004;56:1191-6.